Double-ended and single-ended, angled shafts. Flat handle. 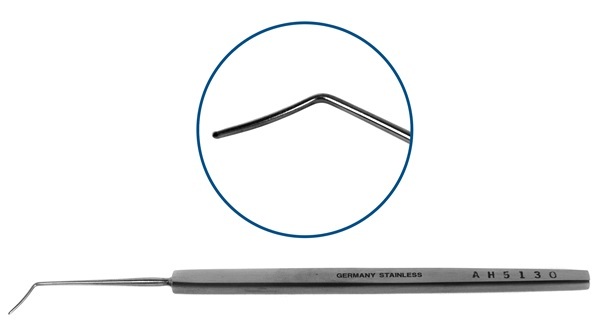 Double-ended, 0.25mm spatula, 10mm from bend to tip, 15mm from bend to tip. Overall length: 137mm. 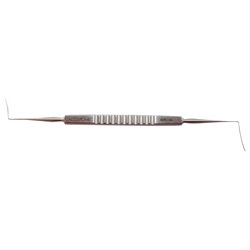 Double-ended, 0.5mm flat posterior surface, 10mm from bend to tip, 15mm from bend to tip, semi-sharp tips. Overall length: 135mm. 0.75mm spatula, 10mm from bend to tip. Overall length: 134mm. 1.0mm spatula, 16mm from bend to tip. Overall length: 140mm.